A pretty and beautifully dressed woman poses for her portrait at the studio of Cavra, located in Philippopoli (Plovdiv), Bulgaria. The street address of the studio was Grand Rue De Chemin De Fer. The woman is wearing a wonderful hat and earrings. A piece of jewelry on her collar features a portrait of an attractive woman. 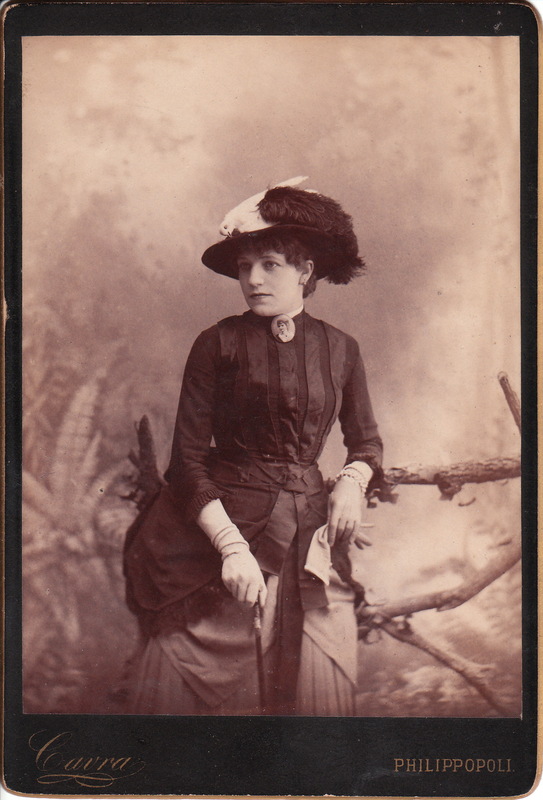 The subject of this photograph is wearing a glove on her right hand and she is holding a second glove in her left hand. Note that she is holding a walking stick with her gloved hand. To view other photographs by Cavra, and to learn more about Philippopoli, click on the category “Photographer: Cavra”. This Cabinet card image is of a father and his two sons posing at the studio of Cavra in Philippopoli (Plovdiv), Bulgaria. Notice the clothing worn by the three members of this family. The father is dressed in the clothing of a peasant while the two sons are wearing more fashionable attire. Note the cane, the umbrella and the two hats in the image. The city of Plovdiv is in south central bulgaria on the Maritsa River. It is presently the second largest city in Bulgaria. The city was in the possession of the Turks who passed it to Russia in 1877. It became the capitol of Eastern Rumelia (1878-1885) which united with Bulgaria in 1885. To view other photographs by Cavra, click on the category “Photographer: Cavra”.